As expected, Apple shares fell on Wall Street this morning. We reported yesterday that Apple’s market performance in Germany fell 6.4 percent yesterday, and after the Monday holiday, US shares are doing the same. According to The Guardian, Apple shares fell 4.1 percent at the market’s open today, and now the AFP reports they have leveled off at a 2.92 percent fall. CEO Steve Jobs’ health has long been linked to his company’s stock value, and his most recent medical leave seems to be no exception. Despite Jobs’ auspicious absence, Apple’s shares fell modestly compared to how they performed overseas yesterday. The company is due to announce its quarter earnings tonight, and investors are likely holding out for the notice. Apple’s holiday sales were reportedly impressive, and it could be enough to stop some selling their stock quite yet. Jobs’ health could affect more than just his own company. Apple is a powerful force in the tech sector, and its shift could directly play into how the entire industry performs on Wall Street. 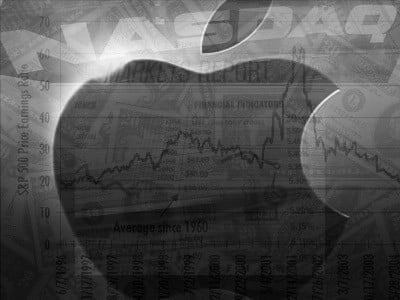 “The market’s reaction to Steve Jobs’ surprise medical leave from Apple…will underscore the importance of the tech sector on the S&P 500 [Standard & Poor’s 500-stock index]…What happens next to Apple will therefore dominate what happens in the sector and the S&P as well,” analyst Brian McCormick told The Guardian.